Click on image to go to Donald P. Ryan's website. Details: In 2007, Zahi Hawass, the Secretary General of the Supreme Council of Antiquities, announced that the KV60 mummy was actually that of Hatshepsut, the famous 18'th Dynasty female Pharaoh. 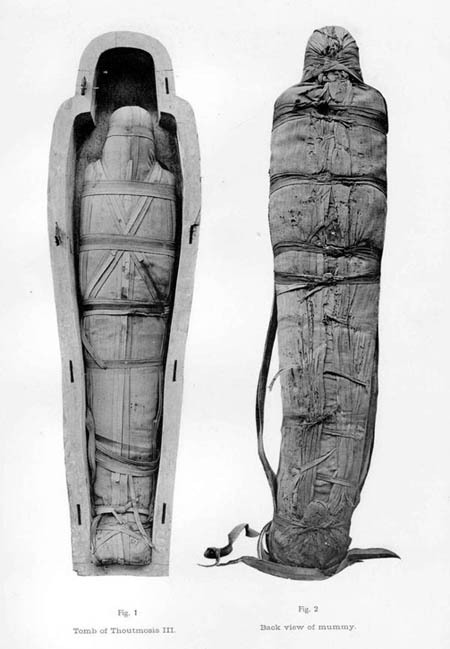 Although this identification is still questioned by some experts, the entry for this mummy has nevertheless been moved to Gallery II of the 18'th Dynasty section, which may be found by going to the menu bar on the left hand side of this page. Photo Credit: From Donald P. Ryan's website. 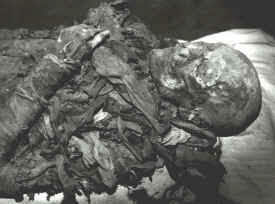 Original Burial: Originally buried intrusively in KV 34. Photo Credit: Photo Credit: RM RM (Cairo, 1912,) pl. XCVI. For high resolution image of these remains, see the University of Chicago's Electronic Open Stacks copy of Smith's The Royal Mummies (Cairo, 1912) Call #: DT57.C2 vol59. plate XCVI.